This week Pantone revealed its Colour of the Year for 2017, and next year's shade is certainly a divisive one. Each year Pantone predicts the hue that is set to make an impact in fashion and design, and next year's colour is a "fresh and zesty yellow green" called Greenery. Think Kermit the Frog or Waitrose green. The two key colours for 2016 were Rose Quartz and a baby blue called Serenity, but this year's choice is a nod towards the environment and is, according to Pantone, a colour to "revive, restore and renew." 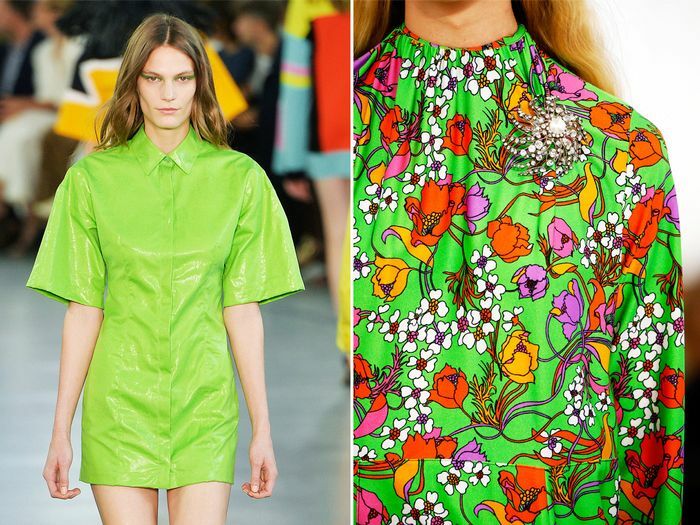 You might shudder at the thought of wearing bright, bright green, but it was seen in the spring 2017 collections at Balenciaga, Pucci, Michael Kors and Kenzo. Greenery seen at Pucci and Balenciaga for S/S 17. 1. London hosted its own equivalent of the Met Gala. On Monday night Gigi Hadid, Lady Gaga, Alexa Chung, Olivia Palermo and more walked the red carpet at the 2016 Fashion Awards. 2. Cara Delevingne returned to the catwalk at Chanel. Karl Lagerfeld staged Chanel's Metiers d'Art show on Tuesday at The Ritz in Paris, and Cara, Lily-Rose Depp, and Lottie Moss were in the model lineup. 3. Victoria Beckham gave the green light to a novel new trend. VB was spotted carrying a faux-fur clutch bag that looks like it could pass as one of Harper's fuzzy teddy bears. 4. And the worst shoe style for your feet is… flip-flops, according to a foot surgeon–turned-designer who shared her helpful advice for shoe shopping. 5. The seven breakfast mistakes you're making: Byrdie revealed how to fix these seven common breakfast blunders. 6. The biggest dress trends to know this New Year's Eve. From sequins to velvet, here is your guide to the key party-dress trends. Now you've had your essential fashion news update, why not give yourself a treat and look back at the best red carpet gowns of 2016?